The annual John Shrum Memorial swim is one of the longest-running open water events in the country. Masters swimmers of all ages, backgrounds, and corners of the globe have been flocking here to compete in the 2-mile race every summer since 1977. The Virginia Masters Swim Team (VMST) has hosted the event since 1981, and its storied history includes more than a dozen occasions where the race also served as a USMS 2-mile cable national championship. Because a cable swim is measured and surveyed to precisely ¼ mile (440 yards), the one and two-mile cable distances are the only open water events in which USMS maintains national records. 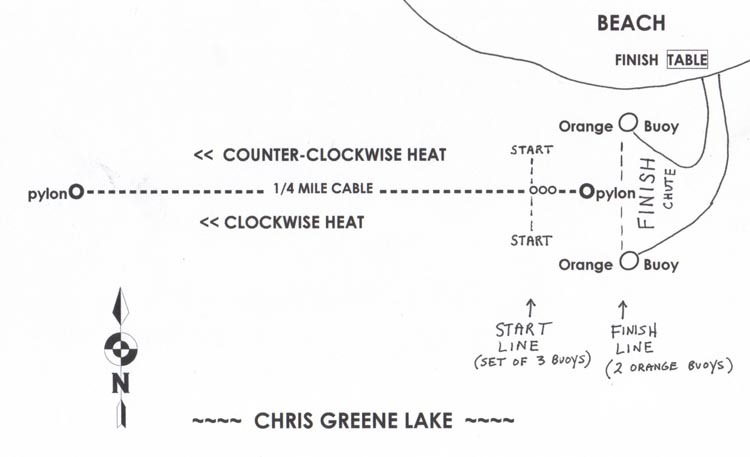 Chris Greene Lake has witnessed many records over the years; in fact, more than half of the current USMS records on the books for the 2-miler took place in these waters. A one-mile cable swim was added to the docket in 2008.